Prevent a single furry invader from turning into a full-on infestation with six easy steps. No horror movie can match the terror of a mouse skitter across the living room floor at night—because where there’s one, there’s likely many, many more. (A single female mouse can give birth up to 10 times a year with six offspring in each litter!) If the pitter-patter of feet alone does not creep you out, the real threat to your health and home should: These wall-dwellers are known to chew through electrical wiring and leave behind droppings and urine that spread diseases. So, if you find evidence that suggests this problem is more than just “a mouse or two”—skittering sounds coming from the walls, ceilings, or room’s corners at night; gnawed corners on cardboard boxes in the pantry; ¼-inch brown pellets on the kitchen floor or counter—call pest control fast. Spotting a mouse before any of these telltale signs of infestation materialize, however, means that you can likely head off the problem yourself with this easy (and humane) guide on how to catch a mouse. Purchase humane mouse traps online or from your local home improvement center. Of the traps marketed as “no-kill,” cage-style traps tend to be more humane than plastic cases, since the latter can have insufficient air. (If you’re limited to plastic case traps, though, you may consider drilling additional airholes into them using an electric drill with a sharp bit.) Start with at least three for the kitchen, but know this: The more you buy, the greater your odds will be at catching. Any other room you may have seen mice or evidence thereof may also require a few traps. Set up your specific model of trap according to the packaging’s instructions. 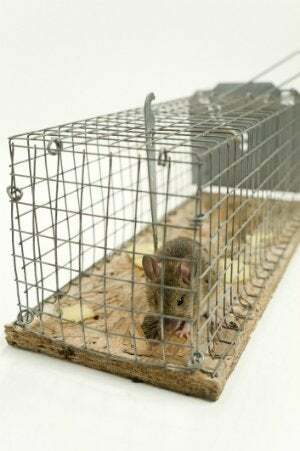 To bait the mice, place a teaspoon of peanut butter in the middle of each trap and press a nut or crumb of cheese into it. The sticky peanut butter ensures that, even if the mouse bumps the trap before entering, the bait of choice remains firmly rooted in the center rather than jostled from its initial position, forcing the mouse to fully enter the trap in order to access the snack. Place your trap (or traps) anywhere you’ve seen mice scurry, nearest the baseboards, as rodents are more likely to run along the perimeter of a room. If you have only heard—but not seen—your furry house guests, you can situate traps in three common gathering places: at the back of floor-level cupboards, behind the fridge or stove, and beneath furniture. 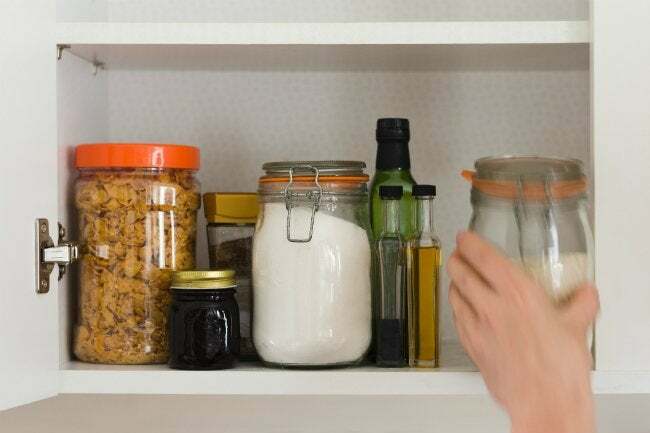 Any kitchen cabinet door that sits slightly ajar is inviting, making the pantry a favorite spot to seek food (and mice won’t be afraid to gnaw through cardboard boxes to get to oats and other dried goods). They love fridges and stoves for the same reasons: the bits of food and grease that can gather beneath and around them. Furniture, on the other hand, will offer enough of a false sense of safety and shelter that they investigate bait. While laying your traps, keep an eye out for any holes or access points; mice can squeeze into any hole the size of a ball-point pen or dime. Position a trap near any you see and, once you catch a mouse, seal those holes pronto with steel wool. Donning rubber gloves, check your traps every morning and again in the evening. It’s imperative you check twice daily, so you can release the mouse as soon as possible. If your traps remain empty, don’t despair. Give it up to three days before relocating it. You may need to test out a few different spots before your traps prove successful. If you catch a mouse, though, grab a heavy-duty plastic bag and then—with gloves on—carefully lift the trap and bag it for transport. Take it to a forest or park at least 500 feet from your home (a distance they likely won’t navigate back) and release the critter. Even after the mouse is out of the house, retrace your steps every couple of days. Look for droppings anywhere you found them before, as well as the other hangouts: cupboards, along baseboards, under the kitchen table, behind furniture, and so on. If a couple of weeks pass with no further evidence of critter presence, then you have successfully put the kibosh on an infestation! 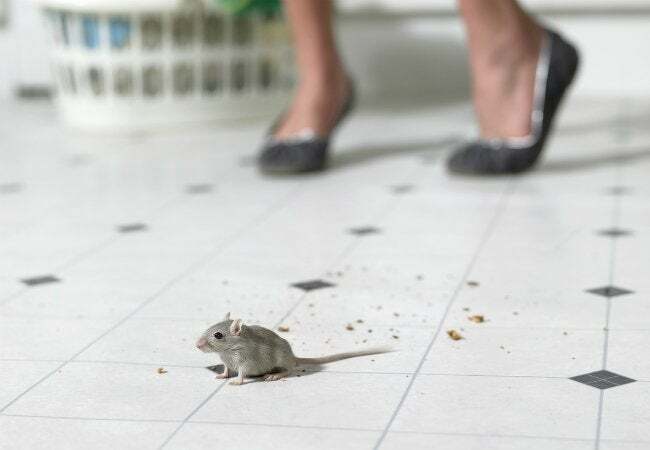 After dealing with a mouse infestation of any size, clean the house immediately and thoroughly. Remember: Mouse droppings spread disease, and older, dried-out droppings can crumble and become airborne if disturbed, which means you can inhale them and get sick. • Scrub all surfaces. First sweep any visible droppings, dispose of them in a trash bag, and seal it. 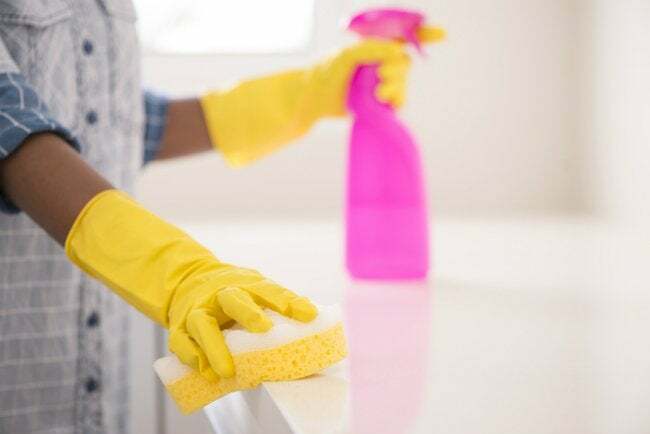 Then wipe all surfaces—countertops, shelving, and floors—in food-focused rooms like pantries, kitchens, and storerooms using disinfectant spray and floor cleaner. Consider adding some bleach to your floor cleaner for its antibacterial qualities. As mice are more likely to climb exterior walls than interior ones, it may not be necessary to wash them (except for peace of mind). • Don’t cut any corners. Pull out boxes, furniture, dishes, and whatever else may be obstructing your inspection and proceed with a flashlight. Kitchen cupboards are notorious for droppings in the corners, so shine a light on in there to be sure you’re not missing anything. • Install a draft guard or door sweep to close the gap wherever exterior doors aren’t flush with the ground. • If there are gaps around plumbing fixtures indoors or out, consider stuffing the holes with steel wool so they’re impassable for mice. • Transfer all dried goods from its original cardboard box or plastic packaging to cans, jars, plastic containers, or ceramic pots—anything with a tight-fitting lid. Even pet kibble and wild bird seed should be stored airtight so that rodents can’t smell them.